With any behavior issue, including anxiety, it’s important to try to find out what’s causing the problem. Anxiety can be caused by any number of things – even health issues. So it’s a good idea to have your kitty seen by the veterinarian to rule out any medical cause. 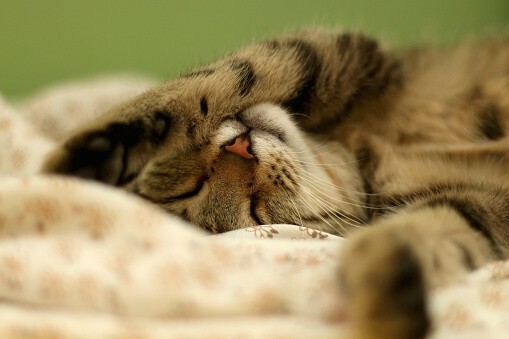 Simply resolving an underlying health problem could relieve your cat’s anxiety. Nervous cats feel safest when they can hide in dark places where they can’t easily be seen. 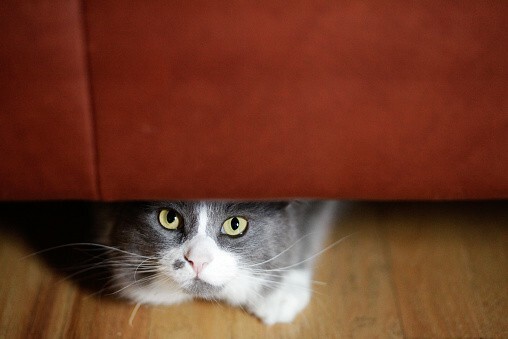 If you’ve got a cat that gets anxious around strangers, provide lots of safe places for your cat to hide out. This could be something as simple as a cardboard box or a covered cat cave, or even a warm bed set up in your closet. 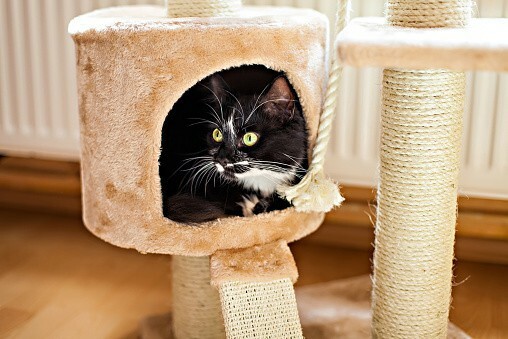 Cats have a natural desire to climb and perch and providing lots of vertical space is especially important in homes with multiple cats, where a lot of anxiety can develop if cats don’t have enough of their ‘own’ spaces to rest on. A cat tree is a great way to solve this issue, and keep kitty off of your counters, fireplace mantle, or bookshelves where you might have breakables! Cat trees don’t have to be an ugly eye-sore either. There are plenty of good looking options! 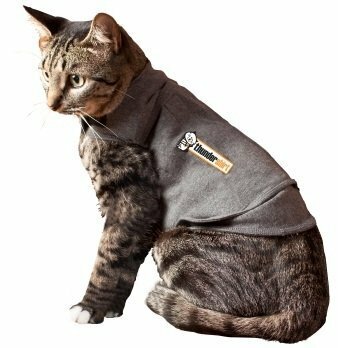 Thundershirt for Cats is a fantastic option for kitties that are nervous when traveling or during thunderstorms. When worn correctly, it applies a constant, gentle pressure (like a hug) on your cat’s torso, similar to swaddling an infant. Using pressure to relieve anxiety has been a common practice for years. 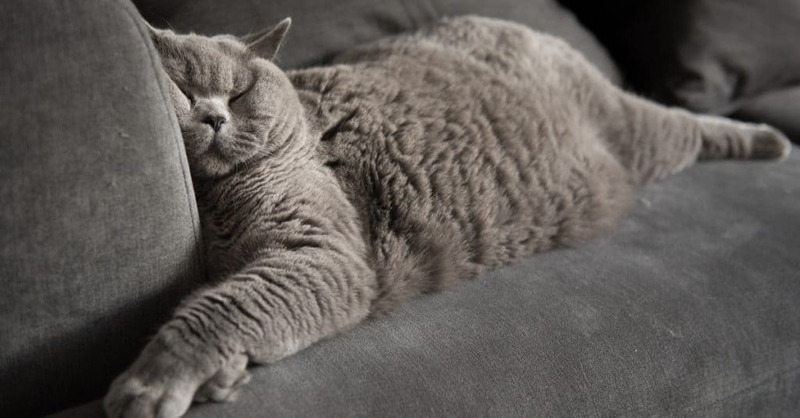 When a cat feels comfortable in their environment, they rub their cheeks against objects leaving a facial pheromone. Feliway is a synthetic copy of the feline facial pheromone used by cats to mark their territory as safe and secure. 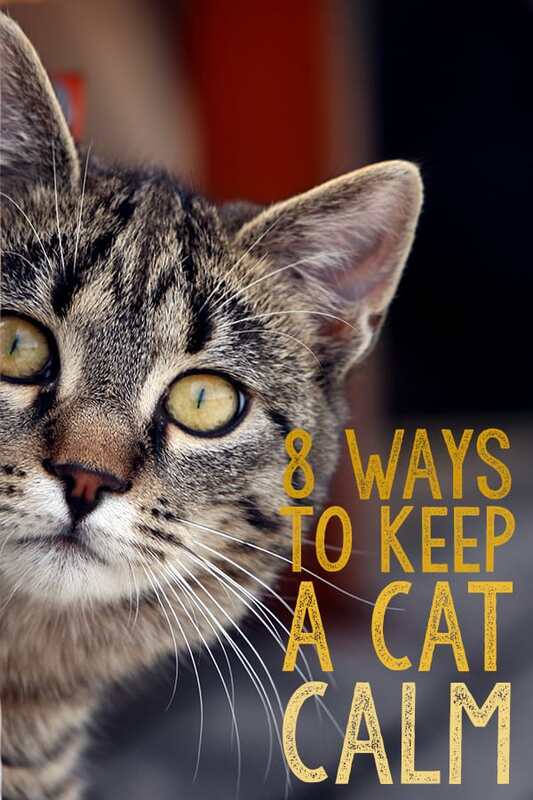 By mimicking the cat’s natural facial pheromone, Feliway creates a state of familiarity and security in the cat’s local environment. You can find Feliway in a spray, that’s perfect to spritz into your cat’s carrier if you’re going to the vet, or spray it in her bed if she’s nervous during a storm. Or, if you’ve got multiple cats that aren’t getting along, try the Feliway diffusers. They plug into your wall outlets, just like plug-in air fresheners, and emit the odorless pheromones into your home to put your cats at ease. Each diffuser covers about 700 square feet, so be sure to get enough for your entire home. Rescue Remedy is a homeopathic, natural way to help support calm behavior in pets during stressful situations. Ideal for times such as travel, thunderstorms, or just going to the veterinarian’s office. Rescue Remedy comes in an easy to administer liquid that you can drop right into your cat’s mouth or drop into his food or water dish. We recently moved six cats across the country and Rescue Remedy was the perfect solution to keep our kitties calm during the three-day trip! If your cat is stressed or fearful, howls, fights, or has difficulty settling and sleeping, believe it or not, music might be the answer! Not just any music, though – music developed specifically for cats. Through a Cat’s Ear: Music for Calming is a CD of music crafted specifically for cats and addresses their need for environmental consistency. The music in Through a Cat’s Ear uses the psychoacoustic technique of “sonic anchoring”—a repeating melodic interlude—to bring a sense of constancy and familiarity into the environment that enhances your cat’s health, happiness, and behavior. Play it when you’re in the car, when you’ve got guests over that make your cat nervous, during thunderstorms, when your kitty is recovering from illness or surgery, or during any times of stress. Another option is Pet Tunes by Pet Acoustics. Using the same concept as Through a Cat’s Ear, but instead of a CD, Pet Tunes is a portable Bluetooth speaker, preloaded with music to relax your cat, so you can take it anywhere! 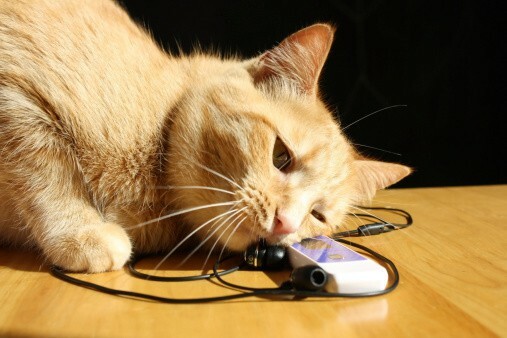 Simply charge Pet Tunes via USB or AC adapter and it will play for 5-10 hours on repeat. 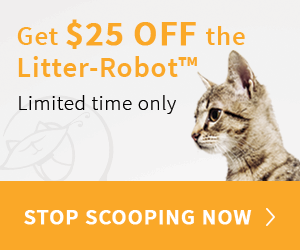 Perfect for cats who have separation anxiety while you’re at work. What other methods have you tried to reduce your cat’s stress? What worked for you and what didn’t? Let us know in the comments below!